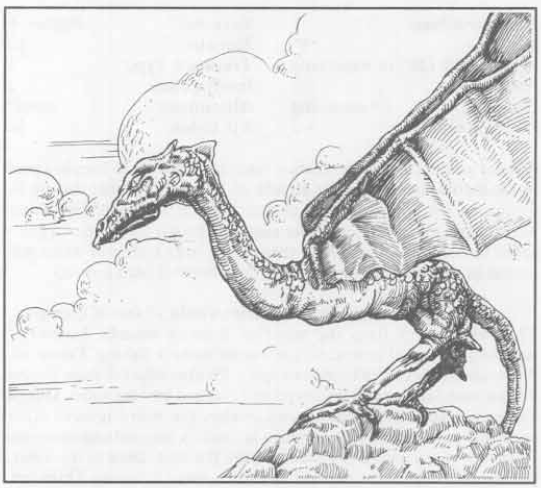 Below find the critter's AD&D incarnation, with a head that looks much more snake-like. It's more accurate to the description, but it's just a teeny bit less intimidating. I'd be careful with that, they got poison quills remember. Just pet it head-to-tail, like a hedgehog! 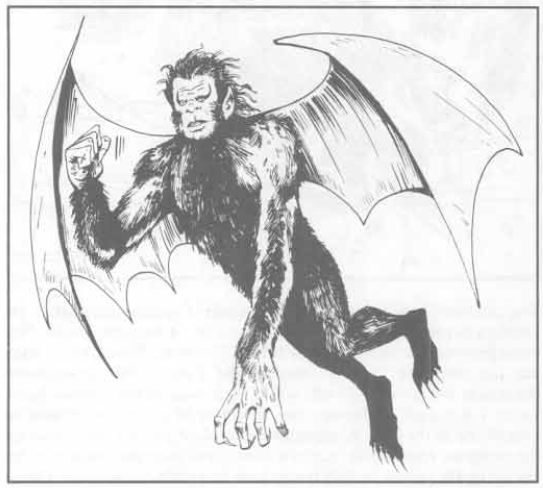 Tabi are cat-sized ape-creatures with golden fur and bat-like wings. They'd probably make great pets, except they give off a rotting stench than can be smelled to 100' away. A tabi has 5* HD and an AC of 6. Tabi attack with two claws for 1-4 damage each; in addition their claws "drip with a crystal blue venom." A clawed victim must make a Save vs Paralysis or become deluded for 2-12 turns, attacking any adjacent creature, and fighting only with weapons or bare hands. Neutralize poison will end the effect. Kind of a mixed blessing there, given that the tabi has to be adjacent to the victim to envenom them, but it could be an interesting way to incapacitate the magic-user. Tabi are fairly slow at 60' (20'), but can fly at 240' (80'). They can pick pockets, move silently and hide in shadows at 40%, and it's noted that they prefer to ambush a lone PC and then hide while the deluded victim fights the rest of the party. Evil; I love it! They come in gangs of 1-4, have an Int of 8, and are Chaotic. They save as Magic-User: 5, presumably because they're small and fragile and magical. Tabi are described as "intelligent and clever" despite their below-human-average Int, and long-lived. They tend to gather "much information about ancient legends and forgotten lore," presumably because that's just what you do when you're a venomous cat-sized winged monkey. It's possible for a high-level (NPC) magic-user to research a spell that will bind a tabi to their service, which is sort of like slavery, but it's okay because tabi aren't really people. A bound tabi is perfectly loyal to its master and will have a Morale of 12 (normal tabi Morale is 6). Tabi feel like a real creature out of Arabian folklore, but maybe that's because I grew up on a diet of Sinbad films. I'm not sure why they stink, but aside from that they're your classic Tiny Magical Pet. For some reason, PC2: Top Ballista made them a PC race, because nothing fits a comical magitech floating city of gnomes and WW1 biplanes like a pseudo-Arabian venomous monkey familiar, right? Look, Basic was weird. That Hide in Shadows chance makes them almost adequate at concealing themselves from people with no sense of smell! For some reason, PC2: Top Ballista made them a PC race, because nothing fits a comical magitech floating city of gnomes and WW1 biplanes like a pseudo-Arabian venomous monkey familiar, right? Look, Basic was weird. '80s science fantasy or bad acid trip? "It also has (picks random monster from earlier in the book)." "...still not clear which, actually." You know, based on how much it has come up in this thread, I hope some does a Let's Read of Top Ballista. Thunderheads are black, reptilian creatures that sort of resemble two-legged dragons, or maybe stingless wyverns. A thunderhead has wings, two legs, a pointed snout, and slit-like, glowing blue eyes. Thunderheads have 16** HD (or sometimes 8** HD - see below) with an AC of 0. They're slow on the ground, only 30' (10'), but fly at 180' (60'). In combat, a thunderhead attacks with two claws for 2-12/2-12 damage, and also sneeze a lightning bolt for 5-30 damage. No, really - they're described as attacking with "a lightning bolt from their pointed snouts." If a thunderhead's claws hit with a 16 or better, the thunderhead has grabbed hold of its victim and will fly away with them - they can carry creatures as larger as a warhorse. Thunderheads live in the clouds, and become agitated during thunderstorms; these are the "normal," 16-HD thunderheads. Thunderheads encountered outside of a storm have only 8 HD, and save as a Fighter: 8 vs the normal thunderhead's Fighter: 16. Thunderheads are dumb (Int 5) and Chaotic, and sold in packs of 1-3. Storm dragon? Lightning wyvern? I like thunderheads; they feel like a real mythical monster, perhaps something out of an American folktale. I could definitely see Pecos Bill taming a thunderhead and riding it up to Alaska or something. The fact that they live in clouds and are twice as strong in stormy weather suggests an overtly magical ecology, which is cool.